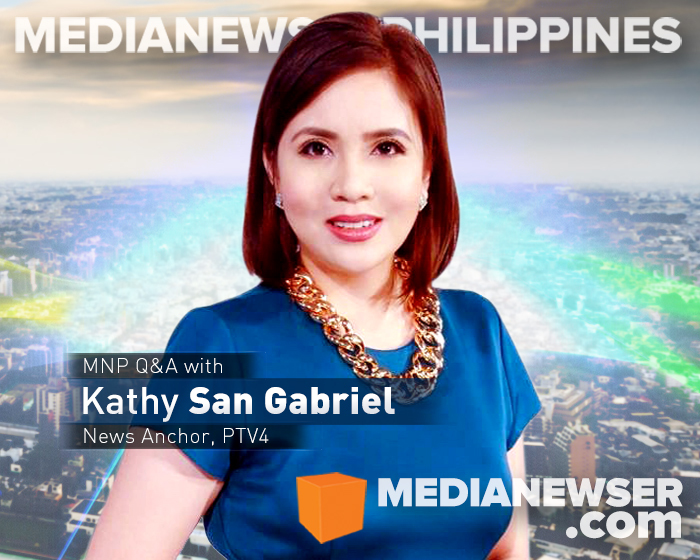 Every night at 6, viewers watch Kathy San Gabriel on her nightly newscast on PTV4. She has been a broadcast journalist since joining the industry in 1999. Back then, she was part of ABS-CBN Channel 2 and its 24/7 news channel, ANC, where she learned most about broadcast journalism. "In my 5 years at the Kapamilya Network, aside from doing anchoring work, I was assigned at first to do general reports," she says. "This means I got to cover fires, floods, protests, press briefings, covered for whoever was absent in the Crame, Defense, and Malacañang beats." For much of the past years, we've seen her as one of People's Television Network's most prominent faces — as anchor of its evening newscast, and host and moderator of the its special programs and coverage. In this MNP Q&A, the young news veteran talks about her storied career, her experience as an ABS-CBN reporter, and her thoughts on the changing media landscape. Be sure to be part of the discussion on Twitter by tweeting us @medianewserphil or posting your comments on our Facebook page. 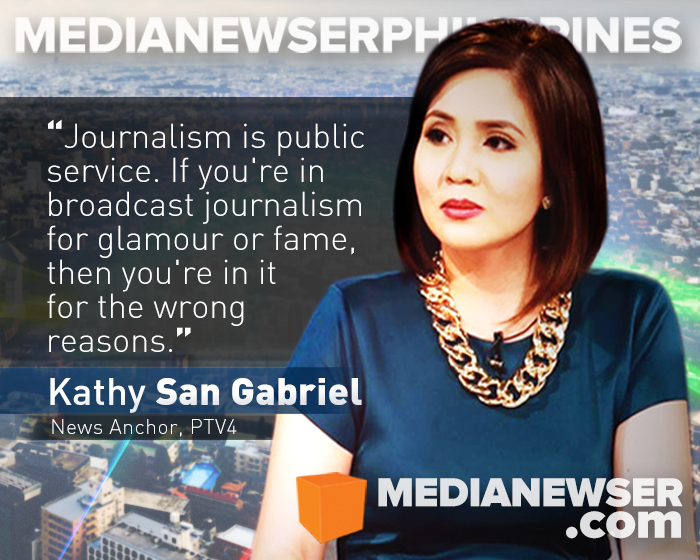 To those who may not be familiar with you, who is Kathy San Gabriel on-cam and off-cam? On-cam, I am a news anchor and host. My on-cam persona is very different from who I am off-cam. Off-cam, I am laid back and definitely less serious. I am a single mom. I spend as much time as possible with my daughter. Cooking is my therapy. I love to travel when I can. Where did your interest in broadcast journalism come from? I grew up watching PEP Talk and The Probe Team. I also loved watching news programs and would read aloud from newspapers in my "newscaster voice." Even as a child, I was already in love with broadcasting. Let's talk about your news background. Walk us through your first foray in the industry — at SNN. In 1999, I saw an ad on SNN (Sarimanok News Network) about auditions for anchors. I was still in college then and working on my thesis. But I was also a working student and needed the money, so I decided to give it a shot. My audition was a disaster! I was a nervous wreck and I stammered half of the time. It took months before I got a call from them, but not for an anchoring job. They wanted me to be a writer. I was writing scripts for ANC for a couple of weeks when they decided to go on 24 hours operation. They got me to do the top-of-the-hour news from 12 midnight to 5AM. I was eventually transferred to the day shift, and was sent out to the field to do various reports. 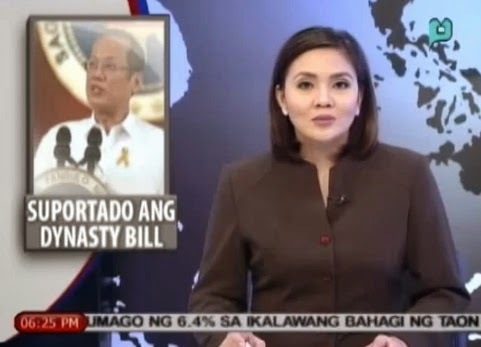 I would say the biggest learning experience for me was when I was assigned to do reports on President Estrada's Impeachment Trial at the Senate. In 2001, ABS-CBN got me to anchor the news advisory and breaking news. What was your experience with ABS-CBN like? How did your experience with the Kapamilya Network prepare you for a much bigger role on PTV4? I pretty much learned most of what I know about broadcast journalism from ANC and ABS-CBN. In my 5 years at the Kapamilya Network, aside from doing anchoring work, I was assigned at first to do GA (General Assignment) reports. This means I got to cover fires, floods, protests, press briefings, covered for whoever was absent in the Crame, Defense, and Malacañang beats. I was also assigned for a couple of months to the graveyard shift (police beat), which really taught me a lot about how to angle stories, establish friendship with people from all walks of life who later on became sources, and just listen and tell people's stories. As for anchoring, my first few years in ANC taught me much of not just news reading, but also anchoring an extended coverage. Being an all-news cable channel, ANC did not have many restrictions when it came to airtime. So once a news story broke out, they could always mount a coverage which could go on for hours. That, I guess, trained me to not get stuck on my scripts but to rely on stock knowledge and at the same time be able to tell a story as it happens. What made you decide to join PTV4 (then NBN4) in 2006? I was on hiatus for more than a year after a high-risk pregnancy and childbirth. I had just come back from the U.S. when I got a call from Tata Rolly (Rolly Reyes, former ABS-CBN executive), who was Chairman of NBN at that time. He asked me if I was ready to get back to the industry and if I was willing to work in NBN. Where are you most comfortable at: anchoring in the studio or reporting in the field? I love both! I do daily anchoring for News@6, but I make sure that I am still able to go out in the field to do reportorial work. I refuse to be labelled as a news reader. As an interviewer, when should you talk, listen or interrupt your interviewee? Could you share to us and to our readers your interviewing style? When I know I am to do an interview, I research on the topic of the interview when time permits. I make it a point to study, because it shows when the interviewer does not know the topic. I also research on my interviewee. This is helpful so I know what he/she has already said about the topic. If there is more than one interviewee, researching on their backgrounds is extremely important so I will know who the right person would be to ask specific questions. In any interview, listening is the key. If the interviewer listens well, she would know if the interviewee is going around in circles; then it's time to interrupt. If the interviewee is not giving a straightforward answer, then it's time to ask a follow-up question. What about your reporting and anchoring style? I am not sure if I have a particular reporting or anchoring style. I just make it a point not to editorialize because I believe that a newscast or a live report has no place for that. The President has been very critical of the mainstream networks for "negativism." How would you describe PTV4's reporting on PNoy and the news general? I would say PTV offers the audience an alternative to mainstream networks' delivery of the news. We veer away from sensationalism. PTV delivers to the people the government's programs because it is in our mandate to do so, being a government owned channel. We do however deliver bad news as well, because the people deserve to know. Do you think there's a room for PTV4 to be one of the primary sources of news in television? Why do you think viewers should consider watching your network's reporting? We have personnel who are good with what they do. Given enough training and funding, I believe PTV has a great potential to be one of the leading sources of news. Do you watch the competition? What shows do you watch outside PTV4's lineup, and also who are the mainstream anchors you look up to? I watch TV Patrol, Bandila, and other ABS-CBN Current Affairs programs. I have much respect for all anchors, especially those who inched their way up through the years and paid their dues, so to speak. Who do you consider your mentor in this business? I consider the late Ka Kiko Frankie Evangelista my mentor. He was my first partner in a newscast (ANC) and also on radio (DZMM). He was very generous, hindi nananapaw. He taught me a lot about interviewing, doing commentary, and news delivery. What can you consider the highlights of your career as a journalist? I consider these my favorites: When I was assigned to President Joseph Estrada's Impeachment Trial because it was my first major coverage. 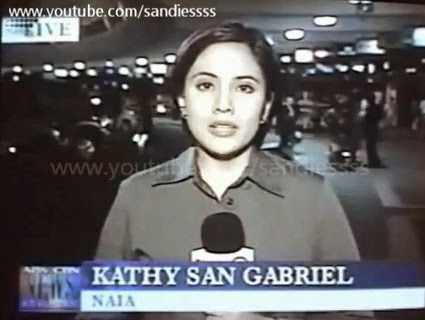 When I anchored the Breaking News (which became an extended coverage) of the 9/11 terrorist attacks and Edsa Tres. When I was a pinch hitter on TV Patrol several times because anchoring TVP had always been my dream. When I anchored Chief Justice Corona's Impeachment Trial live from the Senate because it was such a challenge and I learned so much from it. And when I was assigned to Tacloban and Leyte to report on the aftermath of Typhoon Yolanda because it forever changed me. You're very active on Facebook and Instagram. How important do you think social media in reaching out to your viewers? My Facebook and Instagram accounts were at first intended for family because my mom and siblings are in the U.S. Through the years, people just added me up and so I feel that it's my responsibility to keep them informed about the events I cover or the stories that I do since I believe that they added me primarily so they can be informed. I also think that they would want to get to know a bit more of the person they see on TV, so I post about the things I do off cam. How do you see network news surviving in the 21st century? Network news needs to be more interactive, and we are already seeing that now. There is also heavy use of social media not only as a platform for audience feedback, but as source of news as well. We are now seeing a rise in citizen journalism, which the major networks have already explored. Although the internet is a source of news for many, I believe that people still turn to television mainly because of easier access. News on TV is also more credible, as opposed to that from the internet, particularly on social media. What do you want to do next that you haven't done yet? I would want to learn videography, be a camerawoman, and shoot my own documentaries. I make sure to always have my me time. I dine alone, cook, go shopping, or go to the salon. It is difficult to be a working single mom. There are instances when work takes time away from my daughter. There are times when I would be away for days or weeks. I just make sure to make up for time I'm away from her. Hard work and integrity as a journalist. What advice can you give to aspiring journos out there? Back in college, someone told me, "You're only as good as your last story or newscast." That really stuck. Journalism is public service. If you're in broadcast journalism for glamour or fame, then you're in it for the wrong reasons. The story should not be about us.